Social media is a very powerful marketing tool. It can help increase brand awareness, build your brand image and reach your target audience. But how do you go from having people as social media followers to having them as clients? By having a well-structured social media marketing strategy and performing actions that help increase your conversion rates, you can do just that. Improve your conversion rates with these 5 Surefire Social media marketing tactics. Engaging with your audience is key for building trust. And if your audience doesn’t trust you, they won’t buy from you either. You can’t expect to convert a follower to a customer just because you’ve engaged with them once. Trust takes a long time to build up but is easy to ruin, so that’s why you also want to be careful so you’re not damaging any relationships you’ve already built. 1. Create engaging content. This is the first step to engaging with your audience. Creating content that people will engage with works like a tripwire. First, you get them to come inside your cozy little cabin, also known as your comment section, and then engage with them. In this case, your objective is to create content that your followers will engage with, therefore opening up for an opportunity of continuing the conversation one-on-one. 2. Ask for your followers’ opinions. One of the most effective ways to engage with your audience is to simply ask for their opinions. If you can create both engaging content and captions, that’s even better. There are tons of questions you can ask your followers in order to maximize your comments. …And so on.. there are so many engaging questions and captions that you can use, really. Only your imagination will set the limits here. Of course, it is not engaging if it only goes one way. Therefore, the most important part is that you take the time to answer their comments one by one to let them know you’ve read their comment and that you value it. Why not thank them for their comment and support in your page and brand? The nicer you are, the easier it will be to build that trust you’re looking to establish. 3. Comment on posts made by your target audience. Find a few accounts belonging to people in your target audience and comment on it. Leave some kind words and end with a question. This keeps the conversation going, which will help you build that trust you’re looking to build. 4. Respond to the comments on your post. If you have some followers on social media, there’s a big chance that people will be commenting on your content. Even if you’re not working actively to get them. Make sure you respond to every single one of the comments in a personal and nice way. Show your appreciation to everyone who comments on your post. 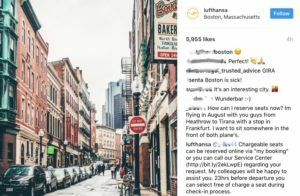 One brand that takes their time to answer almost every single comment (regarding a question) is Lufthansa. They write very thorough responses to their customers’ questions while also offering to help out more. There is not much that is more appreciated by people than seeing someone go out of their way for them, brands in particular. The best ways of getting conversions that really matter are by using strategies that not many (or no one) is using. Because ultimately, that’s when you get the opportunity of treating your followers and potential customers in a way that they never been treated by a brand before – making a long-lasting impact and increasing the chance of a conversion tremendously. Don’t use automated messaging. Doing so will more likely do the opposite of the above-mentioned benefits, as it is very clear that the message they receive isn’t from you personally, thus, making a much smaller impact, if at all, on the recipient. One example is to write a personal message, thanking them for following your page and for their support in your brand. Tell a little more about your service and offer to answer any questions they might have. Once you’ve built some trust, you might be able to pitch something of yours discreetly to them. Providing value lets you address yourself as the go-to source in your niche. This means becoming a business/person that everybody goes to when having a question concerning your niche. For example, when looking for answers concerning social media marketing, some might go to Veloce International, as some people see us as leaders in our industry (which we are very flattered by). Other people might turn to Kevin Systrom (CEO of Instagram) when having questions about the platform. But how do you establish yourself as the go-to person in your niche? With value, I don’t mean real “money value”, even though the valuable information you are giving away might be worth real money. I mean value in the sense that your audience should feel like they’re actually getting something from your social media content. It can be a good laugh, knowledge or information. Which of those you have the ability to offer your followers is up to you. Have you thought about perhaps giving away free copies of your online course or maybe start posting a “fact of the day”? It can also be as simple as linking your followers to a how-to guide that will teach your followers something they’ve always wanted to know how to do. 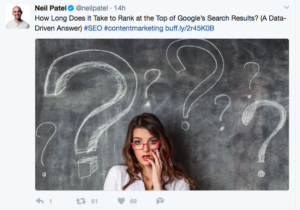 For example, the blogger Neil Patel regularly posts links to his new blog posts on Twitter and is in that way providing value to his followers. Value in the form of knowledge.And as you can see, it seems to be working. This tweet got 61 retweets in just 14 hours. And as you can see, it seems to be working. This tweet got 61 retweets in just 14 hours. The best part is that valuable content is engaged with more, and best of all – shared more than content that doesn’t provide any value. When people share your content, more people will know about you and your expertise. As you’ll slowly gain authority in your niche thanks to the fact that more people consider you as a go-to source, you’ll gain more trust. Why? Because everybody trusts authoritative people, right? It may or may not sound weird but having authority will result in you automatically gaining more authority because people take for granted that they can trust you. This is a situation you want to be in as it will lead to more conversions automatically. You need to find a good posting schedule if you want to establish authority in your niche and ultimately increase your conversions. Going all in and posting 5 times a day for a week, then getting tired and only posting once a month is not a good strategy. You don’t have to post every single day on social media but aim at posting at least once every other day as a minimum. If you stop posting for a week, a month or even a year, people will soon forget about you, thus all your trust and authority you’ve built up will soon fade away. In addition, people will also believe that you have quit and therefore not see a reason to why they would follow you. After all, the reason you choose to follow someone is that you want to see their content and if they aren’t putting out content, it’s easy to tap the unfollow button. 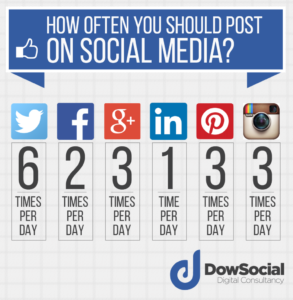 Posting seldom will decrease your growth rate and therefore affect your overall results on social media. Especially your conversion rates. That is why it is important to be consistent and share content regularly. Every post of yours is a new opportunity for you to build trust by engaging with your audience. If you are too busy to post on social media every single day, using post schedule tools such as Buffer and Hootsuite can be extremely helpful. With these tools, you can create drafts of posts you want to make on various social media platforms. Once you’re done, fill in a time you wish the post to be published. Now, the post will be automatically shared – saving you from having to remember to post. Building a social media following is great. But ultimately, those followers will only be valuable for you if they do something. Calls to action are the secret name for the tool that gets your followers to perform actions. Calls to actions are s much more than just adding a link to your website asking people to click it. Instead, tell followers why they should visit your website and the ask them to do so. What is the benefit to them? Once you’ve clearly described what benefit the action you want your followers to perform has, that’s when you can add your call to action. This takes us back to the third point. Providing value. If you aren’t providing any value with your calls to action, you shouldn’t include them. Make sure that you aren’t the only one gaining something. The Call to Action should be a win-win situation.Let’s say you’re selling an e-book. Those who buy it will get the knowledge that is in it (also known as value), and you’ll get their money. There’s so much more behind a successful social media marketing than just sharing great content. Make sure you are Improve your conversion rates with these 5 Surefire Social media marketing tactics, now that you know about them!